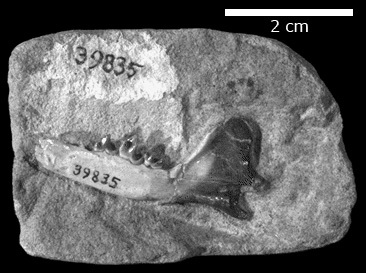 Dentary of Viverravus acutus, a small, civet-like Eocene mammal, collected by Malcolm McKenna, Big Horn County, WY, 1950. The Eocene is the second of five epochs in the Tertiary Period  the second of three epochs in the Paleogene  and lasted from about 55.8 to 33.9 million years ago. * The oldest known fossils of most of the modern orders of mammals appear in a brief period during the early Eocene and all were small, under 10 kg. Both groups of modern ungulates, Artiodactyla and Perissodactyla, became prevalent mammals at this time, due to a major radiation between Europe and North America. The early Eocene (Ypresian) is thought to have had the highest mean annual temperatures of the entire Cenozoic Era, with temperatures about 30° C; relatively low temperature gradients from pole to pole; and high precipitation in a world that was essentially ice-free. Land connections existed between Antarctica and Australia, between North America and Europe through Greenland, and probably between North America and Asia through the Bering Strait. It was an important time of plate boundary rearrangement, in which the patterns of spreading centers and transform faults were changed, causing significant effects on oceanic and atmospheric circulation and temperature. In the middle Eocene, the separation of Antarctica and Australia created a deep water passage between those two continents, creating the circum-Antarctic Current. This changed oceanic circulation patterns and global heat transport, resulting in a global cooling event observed at the end of the Eocene. By the Late Eocene, the new ocean circulation resulted in a significantly lower mean annual temperature, with greater variability and seasonality worldwide. The lower temperatures and increased seasonality drove increased body size of mammals, and caused a shift towards increasingly open savanna-like vegetation, with a corresponding reduction in forests. Florissant Formation, Colorado: Few localities have such remarkably preserved fossil insects as this Rocky Mountain site. Green River Formation: Rich in fossils of plants, insects, and fish, this American locality extends across Utah, Colorado, and Wyoming. See the Wikipedia page on the Eocene. Note: For information on the Paleocene Epoch, 65.5 to 55.8 million years ago,* see the Wikipedia page.